After the eruption of violence in Charlottesville, Virginia, on Saturday, extreme right-wing groups are planning to proceed with marches in Boston, California, Tennessee, Texas and Virginia in the coming weeks. Some local officials, fearful that even unrelated events organized by groups with similar messages could escalate into confrontations, are looking for ways to control or to mitigate the potential for mayhem. In Boston, where a so-called "free speech" rally is scheduled for this weekend, Mayor Martin Walsh declared, "I don't want them here, we don't need them here, there's no reason to be here," according to the Boston Herald. Walsh was reportedly exploring ways to shut down the protest, including by denying organizers' application for a permit. The permit was conditionally granted Wednesday, allowing 100 demonstrators to rally for two hours under the watchful eye of authorities who say they will have zero tolerance for violence. The fact that the event will go on underscores how, under the free speech protections of the First Amendment, cities face an exceptionally high bar to block groups from gathering, even – or especially – groups that espouse hate. "The city has to start out with the assumption that they have to grant a permit," says Mark Tushnet, a professor at Harvard Law School who studies constitutional law. One of the main reasons for that is because organizers are "entitled to a presumption of independent action," says Michael Dorf, professor at Cornell Law School. "If they're the same people, then you can hold their past conduct against them as a basis for worrying about a breach of the peace. But if they're different people, it's not clear to me you can do that," he says. The Unite the Right rally in Charlottesville, as suggested by its name, brought together a broad range of extremist groups. It's unclear which groups – and, more importantly, which people – plan to gather in which cities next. In Boston, for example, organizers of the weekend's free speech rally have said they are not affiliated with those who organized the Charlottesville march. They have reportedly attempted to distance themselves from some of that event's higher-profile speakers, though they have said there could be some "overlap" among attendees. And while officials might not want such displays in their cities, in general they have not only a legal requirement to allow free speech but a duty to protect participants: If there's a chance that counterprotesters will try to disrupt the gathering – what courts have called a "heckler's veto" – it's the city's responsibility to safeguard the groups and speakers holding the rally. "There is an obligation on the state or locality to protect unpopular speakers," says Kent Greenfield, a professor at Boston College Law School. "If the Nazis want to march up to the Statehouse in Boston and they're doing it peacefully and they're doing it in a way that's not threatening anyone, they can do it and the state has an obligation to protect their safety." Those protections are not limitless, especially if the groups gathering might themselves spark violence. The technical term is "incitement to imminent lawless action," a two-part legal standard: not only that a crowd is likely to engage in violence, but that its leaders will incite them to do so. The question, of course, is where to draw the line: What constitutes an imminent threat? "I would think that the Charlottesville stuff would still be very, very relevant," says Robert Bloom, a professor at Boston College Law School. Between the "pictures of these guys with submachine-gun-type weapons" and "the shields with apparently some sort of racist thing on it," he continues, "there's enough evidence to demonstrate that there's a clear and present danger." Yet courts have often opted to give great leeway to free speech as long as it can be disassociated from a direct threat. In one famous case out of Virginia, the Supreme Court concluded in 2003 that a hate group could not erect a burning cross on an African-American family's lawn, but it did have the right to do so on other property on the outskirts of town. "The courts said that the State of Virginia could punish the cross being burned on the family's front yard, because that is seen as a threat and known as a threat," Greenfield says. "The crosses being burned out in the middle of a field somewhere is not seen as a personal threat and therefore is seen as protected speech." The resurgence of the extreme right wing, in part due to the creation of new political identities like the so-called "alt-right" – which has brought together groups that espouse racism, white nationalism, anti-Semitism and populism – presents an added challenge for cities seeking to connect what happened in Charlottesville with the groups seeking permits for upcoming gatherings. "Clearly it makes it more difficult, because of the splintered nature of these organizations," Greenfield says. It's one reason, he continues, that "the best idea may not be to ban them but to cordon off where the permits allow them to speak or march, and keep the opposition as separated from them as necessary." Cities are allowed to impose what are known as "time, place and manner restrictions" that are content-neutral: They can prohibit groups from, say, marching down Main Street at rush hour or from holding a loud rally at midnight. They also have some latitude for preserving the peace, allowing them to establish checkpoints and cordons for protesters and counterprotesters. The police in Charlottesville have been roundly criticized for their handling of the weekend's violence, in which a 20-year-old Ohio man was charged in connection with the death of a woman struck by a car and scores of people were injured. Two Virginia State Police troopers were also killed when their helicopter crashed as they were monitoring the melees on the ground. Police Chief Al S. Thomas has said that the white nationalist groups failed to follow a plan meant to control their entry and exit to Emancipation Park, where they intended to protest the removal of a statue of Robert E. Lee. 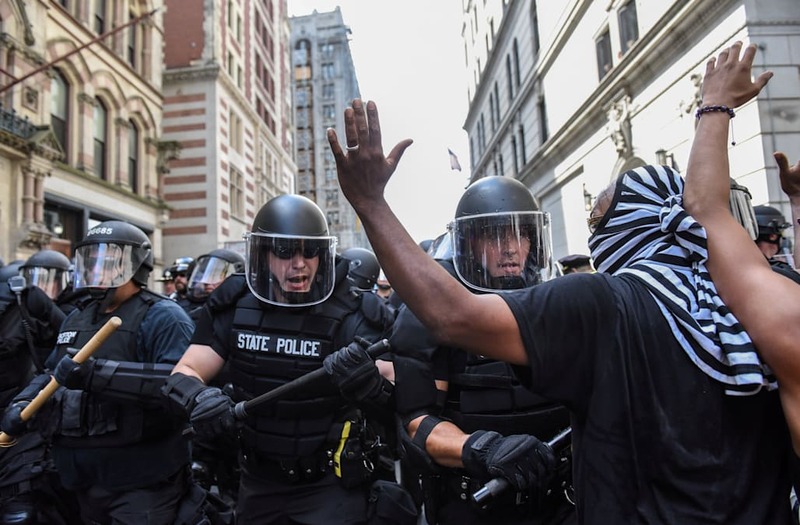 As the protest spilled over into chaos and violence, Thomas said his officers had a "very large footprint" but acknowledged that they had to change from their street uniforms into protective riot gear. A city, faced with a large protest and the potential for violence, is allowed to protest a permit application by claiming it would be such a drain on police resources – and such an expense for the city – that it would have an impact on normal police activities and public safety. But that threshold, too, is exceptionally high, especially because cities can draw equipment and manpower from neighboring jurisdictions. "They can provide police protection and actually have the police step in, instead of just step back as they did in Charlottesville," says Eugene Volokh, a professor at UCLA School of Law. "Police can even tell the person, 'If we see this happening, you're going to be arrested.' But they can't say, 'Because some other people who share your views have said some things that are not constitutionally protected, we're now going to suppress your speech.'"